Jaffna Cal thosai with Nandu (crab) curry anyone? How about Paalappam (coconut milk hoppers) or Palakkottai curry (jakfruit seed curry) with steamed red rice and vilai meen kulambu (mullet fish curry)? Rava Laddu or panipinatu for dessert? More than a gastronomic delight, ‘Jaffna Festival’ which opened at the Nuga Gama of the Cinnamon Grand last Thursday is a slice of Yalpanam’s vibrant culture, replete with craft, dance and music. Traditional Jaffna cuisine known as Yarlpana Samayal known for its blend of aromatic spices and sweet temptations, plays on what Jaffna folks believe to be the six senses of taste aru suvai-sweet, salty, bitter, sour, astringent and pungent. The Yalpanam feast at the Cinnamon Grand has over 70 dishes on offer– an array of main dishes, vegetable, seafood and meat dishes, fried items and a range of authentic Jaffna desserts and best of fruits from the peninsula. Prepared by some expert Jaffna cooks based on age-old recipes, brinjal sambal, Point Pedro dry fish with onion and red chilli and shark mallum among many more promise to tantalize the taste buds. The ten-day Festival which concludes on February 26 offers a traditional Jaffna dinner at Cinnamon Grand’s Nuga Gama premises on weekdays and both lunch and dinner over the weekends. “The Jaffna Festival is an attempt to celebrate a way of life authentic to the region. It is also a means of celebrating the talent and skill behind the food, dance and music featured here,” said Tharika Goonathilake, Assistant Vice President and Head of Marketing Communications, Cinnamon City Hotels. The hotel has teamed up with Jaffna Palmyrah Handicraft Ltd and Katpaham (affiliated to the Palmyrah Development Board) and Punkudutivu Food Manufacturers (PFM) for the event. “Our trips to the region unearthed stories of inspiring women and the festival also aspires to empower them further,” added Tharika. With just Rs. 8000 in hand, P. Jamunadevi and K. Pushpamani set up a spartan cottage industry producing roasted red flour and spices in 2003. The lack of machinery which was beyond their means did not deter these two courageous women who chose to do their work the traditional way. A benevolent regular customer made a donation to expand the enterprise. As the demand for their spice brand grew, Jamunadevi and Pushpamani went from house to house and then to shops to hand-deliver the spices. Around this time the UNDP came forward to assist them to acquire machinery and a new premises. Today the Punkudutivu Food Manufacturers, provides livelihood for over 200 families. “I’m happy that the simple business I helped establish has helped supplement the income of many families, especially those managed by single parents,” says Jamunadevi who adds that the best part of the Jaffna Festival is that it has brought the best quality Jaffna produce including spices to city folks. 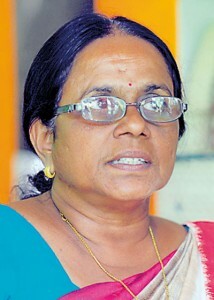 Fuelled by her zest for empowerment, Jamunadevi went on to establish Jaffna Palmyrah Handicraft Ltd a few years ago. A non-profit organisation, it empowers women, largely war-widows. To fine-tune the skills of the artisans and find an export market for these products, Sarvodaya and the UNDP have stepped in, says Jamunadevi. The quality palmyrah products in intricate designs adorn the Jaffna Food Festival. Proceeds from the sale of palmyrah items at the festival will go directly to the artisans. Giving guests a window into Jaffna’s rich cultural legacy is the dance troupe Nakkappu Gramiya Kalai Kulu that performs a popular form of folk dance dating back over 250 years . 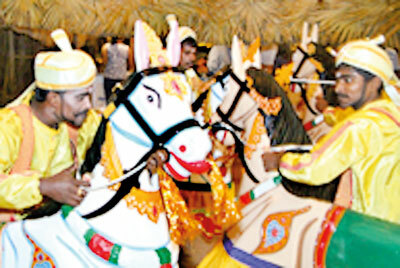 Known as Nattu Koothu it includes Keelu Kudure a dance form where the movements of a horse are mimicked by dancers using a contraption that resembles a horse. Other dance forms including Bommalattam performed by men dressed up to look like life-sized dolls, Mayilattam or the peacock dance and Bharata natyam are also on display.